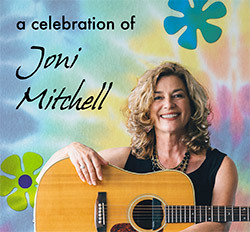 Now singer Kimberly Ford has created "A Celebration of Joni Mitchell," a group of World Class musicians with a shared passion for Joni's music. The band includes George Friedenthal on keys; Lee Rollag on guitar; Tom Buckner on saxophone; Tom Etchart on bass, and Charles Levin on drums. They perform songs from every decade of Joni's career. Kimberly and the band perform beautifully nuanced versions of Joni's quintessential classics, without resorting to Tribute Band-style mimicry... A true "celebration" of Mitchell's artistry. Ford has been a fan since her coming-of-age years, where she learned to sing using Mitchell’s soul-baring, 1971 “Blue” album as a primer. “Her poetry and melodies spoke to my experiences before I even had a language for them." More information here.